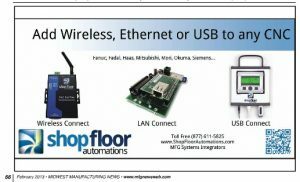 See our latest hardware ad in February issue of Manufacturing News (AKA MFG News) – one ad is Here (Midwest Manufacturing News)and the other is Here (Southwest Manufacturing News). Call (877) 611-5825 for more information and insight on how to improve OEE on your shop floor! We are also on social media – tweet us, like us, follow us, and check out our photos!